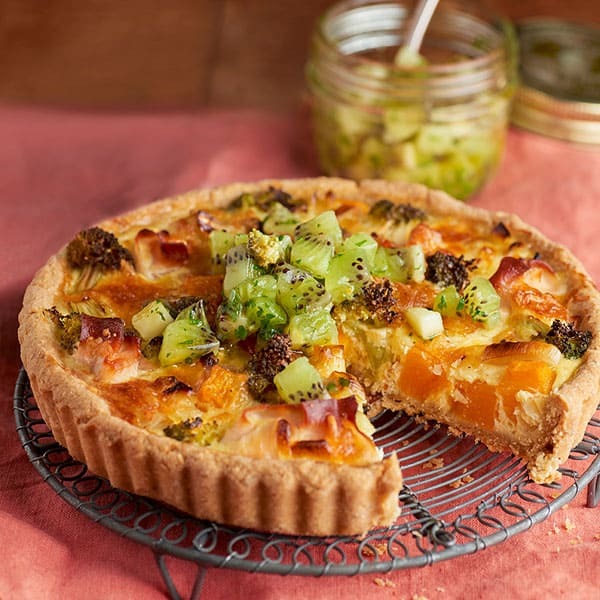 Quiche is a great way to use up all all kinds of ingredients, such as vegetables, cheese, fish, sausages and many more. Use whatever you have in the fridge and top with chopped Zespri Green kiwifruit and fresh herbs to give it some extra zing. In a bowl, mix the flour with the softened butter, egg and a pinch of salt to obtain a firm dough. Wrap it in cling film and place in the refrigerator for 30 minutes. Beat the eggs with the milk, cheese, salt, pepper and chopped garlic. Clean the vegetables and cut them into regular-sized pieces. Steam or boil the broccoli and pumpkin for 4 minutes. Sauté the leek in a frying pan with a little oil over a low heat for about 6-8 minutes until soft. Remove from heat and reserve. Roll out the dough with a rolling pin on a floured surface and then use it to line a greased, loose bottomed flan tin. Pour the vegetable, turkey slices and egg mixture into the pastry and bake in the oven, preheated to 200° C, for 35 minutes. Remove from the oven and let cool. Peel the Zespri kiwifruit, cut into small cubes and place in a bowl with salt, pepper, oil, a few drops of lemon juice and the chopped parsley. Serve wedges of quiche with the kiwifruit on top. Why is Zespri kiwifruit good for you? If it tastes good, then it must be bad for you, right? Sadly, there are lots of tempting foods that taste great but do nothing for us nutritionally. Luckily, the kiwifruit is an exception.